While skeletal muscle tissue is responsible for synthesizing ~90% of the glutamine found in the body, the most eager consumers of glutamine are the gut, kidneys and immune system. Glutamine is, therefore, supportive for a variety of biochemical functions ranging from protein synthesis to intestinal permeability, optimal immune function and the regulation of the body’s acid-base balance. Repeated activation of the stress response can reap havoc on muscular size, strength and power. 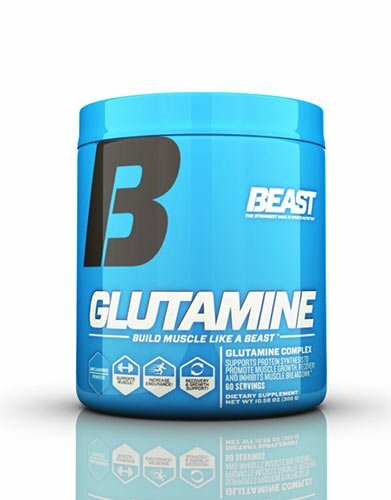 Studies suggest that glutamine not only helps inhibit the catabolism of muscle by promoting nitrogen retention but promotes muscular growth. * Preserve hard earned muscle! High intensity exercise can lead to rapid fatigue (i.e. muscular failure) due to the depletion of immediate energy stores and the production of lactic acid. Because glutamine can act both as an energy source and a lactic acid neutralizer, studies suggest it may help delay the onset of muscular fatigue. * Go harder for longer! Glutamine is a fuel source for the immune system and gut where it helps to maintain the integrity of a healthy GI tract. * Support health and stay energized! How much to take and when? Because the gut and immune system are most active during periods of recovery and sleep, it is best to supplement with glutamine after intense workouts and before bed. Take with cold or room temperature foods/liquids. DO NOT HEAT. For muscle preservation and workout recovery take 3x6g servings for 18g/day. *Because glutamine has a rapid turnover rate, up to ~30g/day can be easily tolerated by the GI tract. Glutamine is not recommended for ketogenic dieters or those with diabetes, epilepsy, biopolar disorder.